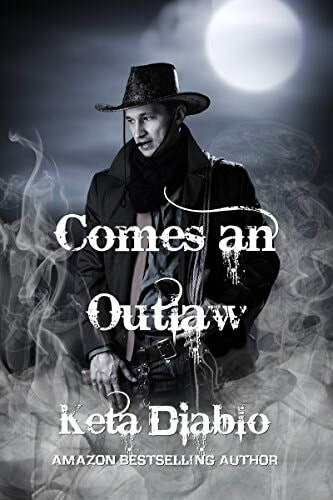 Comes an Outlaw by Keta Diablo is a captivating paranormal romance set in 1885 Arizona. The old west is a perfect place for this tale of a widow’s struggle to survive against great odds, with love and help from beyond. Jesse Santos lives with her twelve-year-old son on her late husband’s ranch, which has been in the family for generations. Since Cain’s death, she has worked the land as best she can, despite drought, cattle rustlers and the fear she is losing her mind. Although she misses her husband, she wishes his spirit would stop talking to her. Cain worked for a psychic investigation company and deeply believed in ghosts. He promised her he would come back to help her after his death, if she needed him. However, she can’t quite believe it’s really him and not hallucinations from a brain addled by too much stress. When Cain tells her that help is coming on a piebald horse, she doesn’t know what to think. Then, Cain’s younger brother Coy arrives out of the blue. He could be a big help, but he doesn’t intend to stick around. Not knowing his parents and brother had died, he only planned to stop in for a short visit before continuing to Utah, but the beautiful widow and her courageous son won’t make it without him. The hardscrabble existence of life in those days, the engaging characters, and the fascinating look at Yaqui Indian culture, carries the reader into a simpler time when it was easier to believe in spirits and their ability to communicate beyond the grave. This story was an entertaining read that kept me spellbound to the end. Coy says one thing to Jesse that truly encompasses the essence of the story: At last he turned and faced her. “A man loving you from beyond the grave, I’d take that as the highest compliment one can give a woman.” That statement just shreds my heart. If you enjoy Romance, Paranormal stories, or Westerns, read Comes an Outlaw. You will love it.